A while ago, we introduced our Affiliate program that helps you monetize your influence by referring pCloud to your followers; today we are announcing yet another way to make money with pCloud: our reseller program. It’s very simple: you purchase premium pCloud services in bulk and then sell them to your own clients. As a registered reseller you will be getting significant discounts, which will make up your profit margin. What you actually buy us special voucher codes. These codes are user for instant activation of pCloud plans – so you just need to send the code(s) to your client after they make an order. When it comes to your reseller profits, the sky is the limit. You are the one who determines the prices, at which to sell our products. You have complete freedom when setting up your pricing, and we will not meddle into that. Even if you sell at the same prices we do, you would still collect the difference between the price the client pays and the discount you get from us. Is the reseller program right for me? Do I have my own point of sale? If you have a functional website or online store, for example, you cover the first eligibility criteria. Can I accept and process payments? Can I comply with the minimum purchase requirement of $50? Can I sell at least $100 worth of pCloud services every month? If you said “Yes” to each of those four questions, you qualify for the program and you can sign up right away! I don’t meet the reseller program criteria but I want to partner with you anyway. What should I do? If you are not eligible to become a reseller, you can always register as an affiliate of ours and promote our services that way. The earnings you can get as a pCloud affiliate are practically limitless, so why not give it a try? Sign up here: pCloud Affiliates. What pCloud services can I sell? As a reseller, you will be able to offer three plans: pCloud Premium, pCloud Premium Plus and pCloud Crypto. All of these can be purchased either as monthly or annual subscriptions, and both premium plans can be combined with the Crypto service. 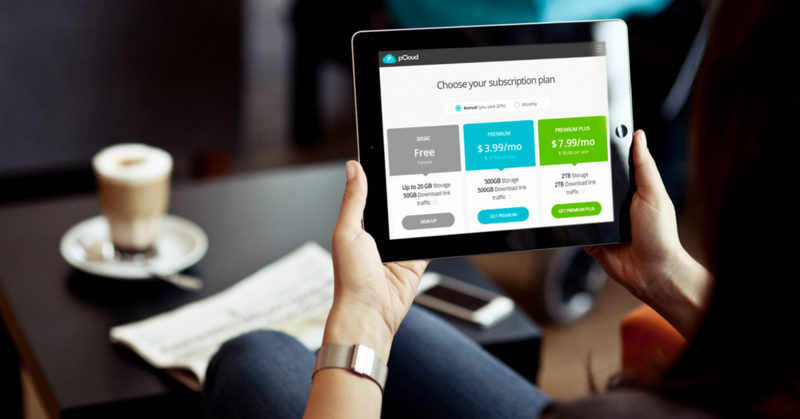 pCloud Premium Plus offers an even better value. It has all the features of Premium plans but comes with 2 TB of storage and 2 TB of monthly download link traffic. Crypto is a service that allows users to benefit from client-side encryption and zero-knowledge privacy. Setting up a Crypto folder is a piece of cake for the users but it offers a level of protection that remains unmatched.